Anne Curtis dedicates a surprise number to her husband Erwan Heussaff at the AnneKulit: Promise Last Na 'To concert last August 18, in Smart Araneta Coliseum. The train of her Neric Beltran bridal ballgown was used to project montage of photos and videos from their New Zealand wedding last November 2017. Anne Curtis just finished another successful concert at the Smart Araneta Coliseum last August 18. Anne Kulit: Promise Last Na ‘To marked the It’s Showtime host’s 21st anniversary in showbiz, and gave the fans a night of spectacle and performances. Her onstage collaborations featured Sarah Geronimo, James Reid, and Regine Velasquez. Anne also enticed the crowd with her eye-catching concert outfits—from a Furne One couture body suit to an all-denim Kimhekim couture ensemble. But one of the fashion highlights was the dreamy princess-cut ballgown she wore during her surprise number for husband Erwan Heussaff. Designed by Neric Beltran, the train cascaded from the top, creating a makeshift white backdrop. 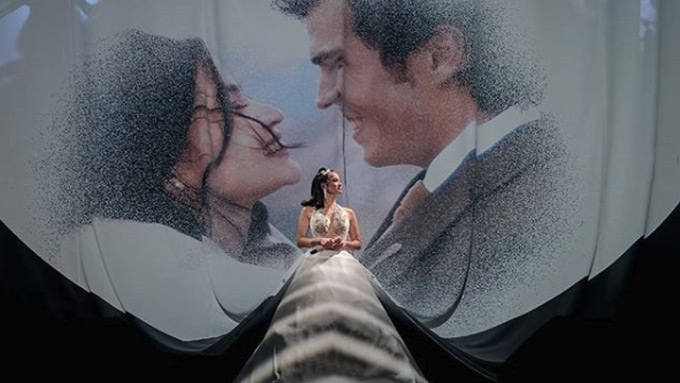 As the Kapamilya star sang the acoustic version of The Cure’s “Just Like Heaven,” montage of photos and videos from Anne and Erwan’s New Zealand wedding last November 2017 was projected on the train. After the performance, Erwan joined his wife onstage to give her a bouquet of flowers.